This was our home in Ohio which we had to sell back in 2002 which means that these pics are at least 15 years old, and judging by the way my brother looks, are probably closer to 20. While mostly different angles of the front of our house, I also managed to capture our dog Pinto that my mom brought out to Colorado, and who sadly didn’t survive long after that. Also in the background is a straw barn that we spent many an afternoon playing in back in the day. These were taken by me, with my Kodak Cameo Focus Free point & shoot camera, picked up at a thrift store at some point and probably still in my top drawer in the chest at my dad’s. I bumped up the contrast a bit but that was all, and am pretty impressed with how good the images held up, even if they do now look a bit vintage. Knowing from experience how reluctant people are to drop off old film at a camera store these days, I recently had a single-use camera processed for a friend of mine and they were at least this usable. If people you know have film lying around undeveloped, please encourage them to make a trip to their local camera store, or barring that, offer to do it for them: it’s a nice favor and can bring back some great memories. The chapel at the United States Air Force Academy, Colorado Springs, tends to draw quite a few visitors because of its interesting shape (you can search for pics online). But also due to its unique architecture it has always suffered problems with leaking, and will therefore close for renovation next year. If you’re planning on visiting Colorado Springs soon, you might want to check out the Academy chapel as your next opportunity could be at least 5 years from now. While giving a tour of my city I took the opportunity of the bright sunlight to really let the stained glass do its thing inside the chapel, and the Ektar 100 really let the colors pop. Below is a view of some of the dormitory buildings. 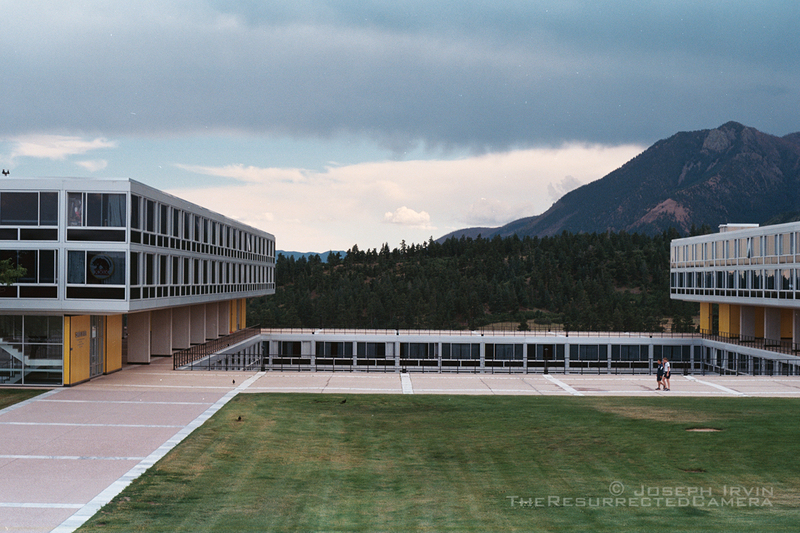 If you enjoy mid-century modernism the Academy is fantastic, and offers striking contrast with its surroundings.